Few artists can capture visceral action sequences and the dynamic human form like Joe Kubert, and his expressive talents are fully realized in his 1970s Tarzan comics. This beautiful archive collection-with an introduction by Kubert and color restoration based off of Tatjana Woods original colors-is a must-have for fans of timeless adventure tales and Joe Kuberts undeniable intensity and skill. Beginning with this first volume, Dark Horses hardcover series reprints Kuberts entire Tarzanwork. Join us on these primal adventures, as Tarzan discovers the pleasures and perils of the African wilds ... and the many dangers posed by both man and beast! 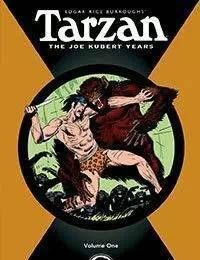 Joe Kuberts Tarzan,Volume One, reprints issues 207 through 214 of the 1970s run, featuring Origin of the Ape Man (a bold adaptation of Edgar Rice Burroughs first Tarzan novel), Jungle Tales of Tarzan, and other stories inspired by Burroughs books-all written and drawn by the legendary Joe Kubert!